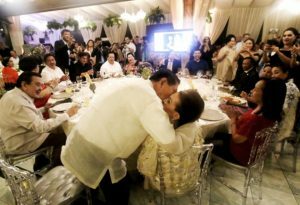 Katrina Enrile cajoled her parents, JPE and Cristina, to kiss before the guests, but her father appeared hesitant, prompting Katrina to shout, “Dad! Kiss Mom!” several times. Gigi Reyes, bitten by the green monster, banged her head again on the walls of her detention cell…. Those who voted to defund CHR will be re-elected again and again. Thanks to their DYNASTIES…. Joey Salceda Harry Roqwe Koko Pimentel will soon issue Statement of Solidarity with their sistah Chit Gascon…. Kung MABIUDA nga nmn si Lucy Torres baka sya ligawan ni Rody so “YES” na ngarud sa 1k budget ni Chito….